Last week I signed up to test a pattern by the adorable Elisa Clark from Charming Doodle. I recently found her blog and I can't get enough. She has some talent! Her newest pattern is the Knight Hoodie and it for sizes 2T-10 (but there are rumors that a tween/adult pattern will be released soon). The awesome thing about this this pattern is it's not just for little boys. I made one for my 6 1/2 year old daughter Maddie. She is pretty big for her ago so I made her the size 10. I took her to Joann with me to pick out her fabric and this is the combination she came up with. At first I was curious about how it would turn out but now that it is done I couldn't be happier. Maddie's in love with it too as you can see. This was my very first hoodie and my first time working with sweatshirt fleece. This pattern came together so easily. It took a bit to get all the different pieces cut out but once it was cut I was able to sew it together start to finish in about 2 hours. The next one I make will probably take even less time. 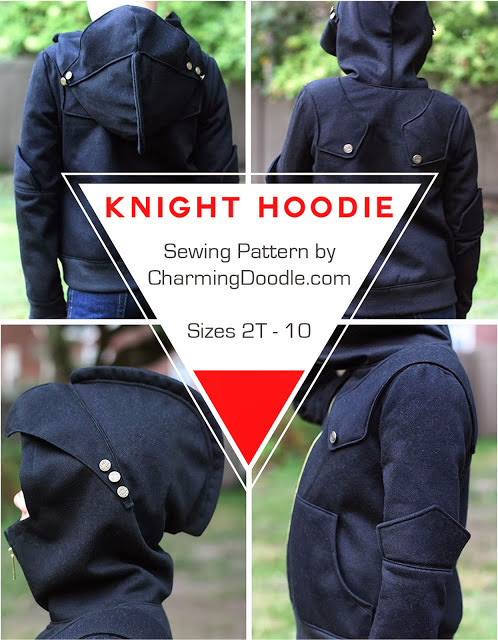 This Knight Hoodie comes with very unique detail and "armor pieces" as well as buttons for accent. I didn't change anything about the pattern but by changing the color and making contrasting pieces it has a completely different look. The fit on this pattern is loose but not baggy which I really like. It zips all the way up to the chin to give the look of armor. Maddie was excited to get to play with Daddy's toy sword from last years Halloween costume during our photos. Here are some up close pics of the details on the Hoodie. I could not find ribbed knit or a zipper that matched our neon fabric so I just picked up some solid white and used Fabric Spray Paint to give it a graffiti vibe and coordinate with the fabric better. I am scared to death to paint things like furniture but I have this weird obsession with fabric paint. As you can see below I used the same Fabric Spray Paint to make Maddie's birthday shirt for her birthday earlier this year. Just for fun, here's Maddie trying to be an 'evil knight'. My silly girl is just too sweet to pull it off. If you love this pattern and want to pick it up, go here and use the code DECEMBERKNIGHT before Christmas to get the pattern for $3 off. I know this will be a well loved pattern in our house. My younger daughter is already bugging me to make her one. The sweater came out really nice. I like the color you chose. I love your version Erin - especially the paint effect on the bands!! WOW. I love how you transformed what could perceived as a boy pattern and turn it into such an adorable little girl hoodie. It turned out great. Hard to believe that it's your first attempt at making a hoodie.